Four in a row is similar to the paper game "noughts and crosses" but we have changed it into a one person Italian learning / revision game. 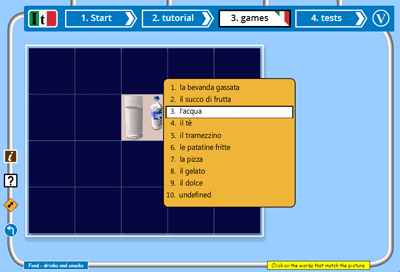 The aim of the game is to win 4 cells in a row from a grid of 20 cells by selecting and naming pictures in Italian. The game will reinforce your memory of the Italian vocabulary you have chosen to learn by getting you to match that vocabulary to the correct picture. Select "4 in a row" on the Italian games selection page. Roll over any text to play the Italian audio for that text.